PENSACOLA BEACH — A beautiful yet venomous lionfish, native to the Indian and Pacific oceans, has been captured on a reef about 16 miles off Pensacola Beach. 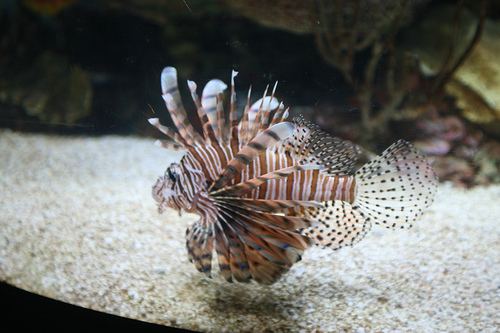 It’s the first documented lionfish found off the coast of Northwest Florida and the second one confirmed in the eastern Gulf of Mexico, although there have been other undocumented sightings, said Eilene Beard, co-owner of Scuba Shack on South Palafox Street. The 6-inch fish, captured Sept. 9, is residing in a saltwater tank at the downtown dive shop. It has red and white stripes, a tall row of venomous spines and fanlike fins that resemble a lion’s mane. Its discovery is igniting fears that the invasive species is rapidly spreading from the Florida Keys and its population may explode here. “I’m sure there are more lionfish out there,” said Robert Turpin, a marine biologist for Escambia County who captured the fish. The biggest concern is that the lionfish will decimate recreational and commercial fish populations, including grouper and snapper, said Jon Dodrill, environmental administrator with the Florida Fish and Wildlife Conservation Commission, Marine Fishery Division. “They’re ambush predators and voracious eaters,” he said. Another concern, Beard said, is lionfish will soon show up closer to shore, such as at the Fort Pickens jetty, a popular spot for inexperienced divers. “Divers there are more likely to lose their buoyancy, fall and touch one,” she said. There are no major predators or diseases to control the populations. But, Dodrill said, there is a campaign to market the “tasty” fish as food to help control the population. Dodrill said the lionfish population exploded off Key West. “In early January 2009, the first lionfish was reported in the Keys, and basically, in a year and a half, we went from no observations of lionfish to sending teams of divers out collecting more than 250 of them,” he said. Questions loom large about the origin of the lionfish. The National Oceanic Atmospheric Administration is examining hundreds of samples of lionfish found up and down the Eastern seaboard, the Caribbean and the Gulf of Mexico. Scientists want to find out if the fish originated from about a half dozen lionfish that came from an aquarium that washed into the Atlantic Ocean during Hurricane Andrew in 1992. It’s also probable that more of the popular aquarium fish washed into Florida waters during other hurricanes or were released by owners who could no longer keep them.